a community of local startup entrepreneurs, freelancers and collaborators – helping develop your innovative ideas into viable business models. coworking, collaboration, connection, collocation, and cooperation with networking, workshops, meetups and more! Located on the Coffs Coast NSW and expanding into surrounding local government areas – Bellingen, Kempsey, Nambucca Valley and Clarence Valley. 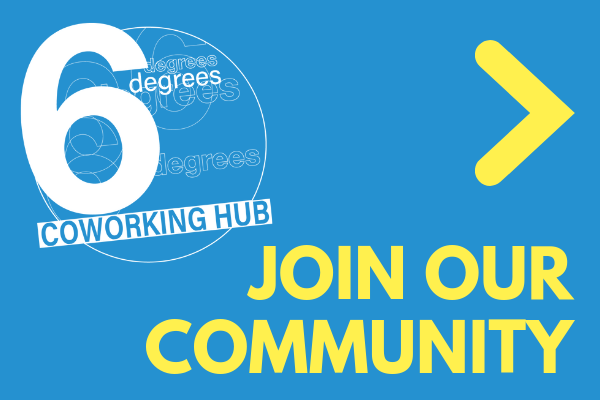 ⊕ Free tickets to 6 degrees events including Pitch Your Passion (a great opportunity to give and get feedback), Salons and other networking events – make connections! ⊕ Regular email newsletters to keep you in-the-loop with upcoming events, member news and relevant info for start-ups, freelancers and new businesses. ⊕ Zoom video link up opportunities at supported co-working spaces – depending on availability and booking of room. *Bookings essential – dependent on availability. Includes free wifi and access to coffee/tea and kitchen facilities.